I can only hope this is actually the Rebbe Ztl and his son Ztl. 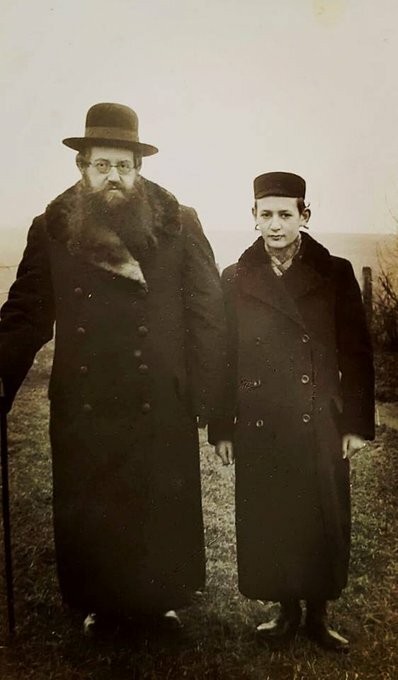 problem is that the mannish isn't that of a Rebbe and doesn't tally with what we have seen the Rebbe wearing in other pictures. The coat has uncovered buttons and outside pockets. A Rebbe of that time would be wearing a fur trimmed Tulip, (a silk coat with no pockets and flap over the buttons. Still, if only, it would be a first. The sefer, Chovos HaTalmidim, A Student's Obligation, was published in 1932 and written by the Rebbe of Piazeczna, Rav Kalonymous Kalman Shapiro, zt"l. The sefer, itself, is powerful. However, the introduction sheds light on students and children leaving the path of Torah Judaism. היכן נמצא הארכיון של היבלונר רבי?